The image flickers on the screen as you sit in the relative safety of your vehicle. Then it happens...a blood-curdling scream shrieks through the little silver box attached to your window. You cover your eyes and peak through your fingers. 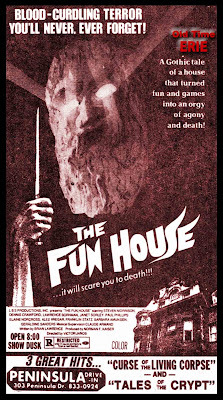 That's the price your pay for viewing horror movies like "The Fun House" at the drive-in theater. The Peninsula Drive-In was located at 301 Peninsula Drive, where the Tom Ridge Environmental sits today. Shows started at dusk, and there was usually a double or triple feature. 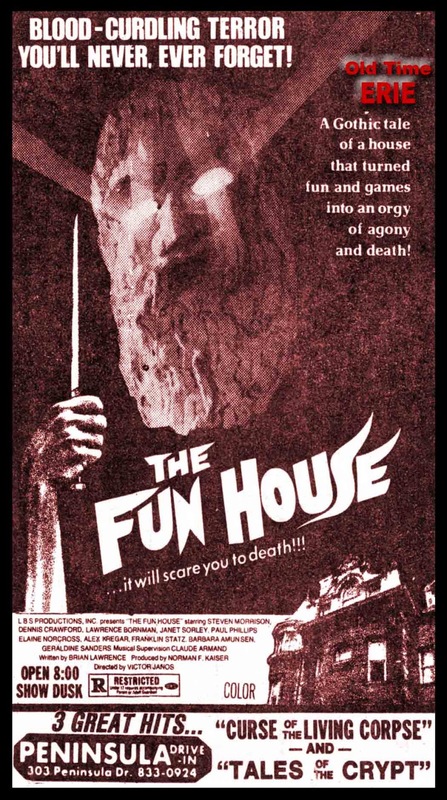 Sometimes the early show was aimed at a young audience (think Herbie the Love Bug), and other times the movies were strictly for a mature audience. There was generally a long line of cars waiting to get in to the Peninsula Drive-in, which opened around 8 p.m. Cars would snake their way along the gravel covered lanes, which made a distinctive sound when you drove over them. The lot wasn't flat; it was quite a bumpy ride over the humps in the road. Station wagons would bottom out if there was a pothole in the lot. Gimme Gravy, on my Mashed Potatoes...That song gets stuck in my head when I hear people talk about the super mashed potatoes from the cafeteria in the basement of the old Boston Store. You could also get a hearty bowl of vegetable soup or a super sweet milkshake. Thankfully, I don't associate those items with any songs. The Cafeteria was in the basement of the Boston Store at 718 State Street in Downtown Erie, PA. It was always packed with students from Gannon College, Prep, Villa and St. Ben's, just to name a few. So, grab your tray and make your way through the original 'fast food' restaurant. Everything is so shiny in this shot of the cafeteria, just as it was on every floor in the store. I like the glass block on the outer wall. The tables are set up for two or four people at each setting. Thanks to Bill for sending in this awesome photograph. 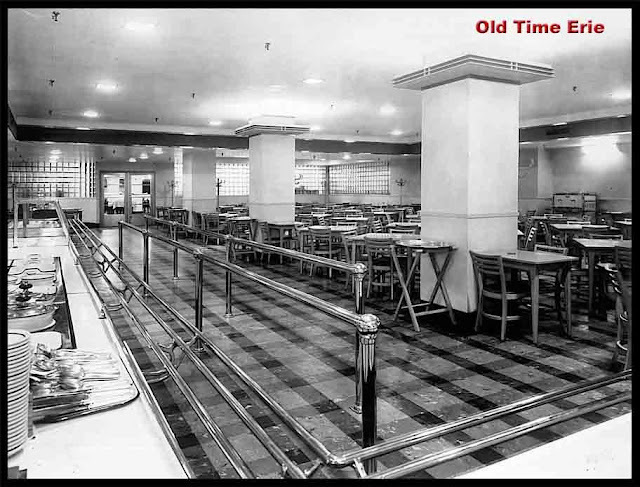 Click here to share your Boston Store Cafeteria memories. When I saw this ad for the Marvintown Bowling & Billiard Academy, the surname caught my eye right away. I knew several of the Wolfram boys from school and the old neighborhood. This family has lived in the old homestead on East 26th Street near St. John's Catholic Church for nearly a decade. 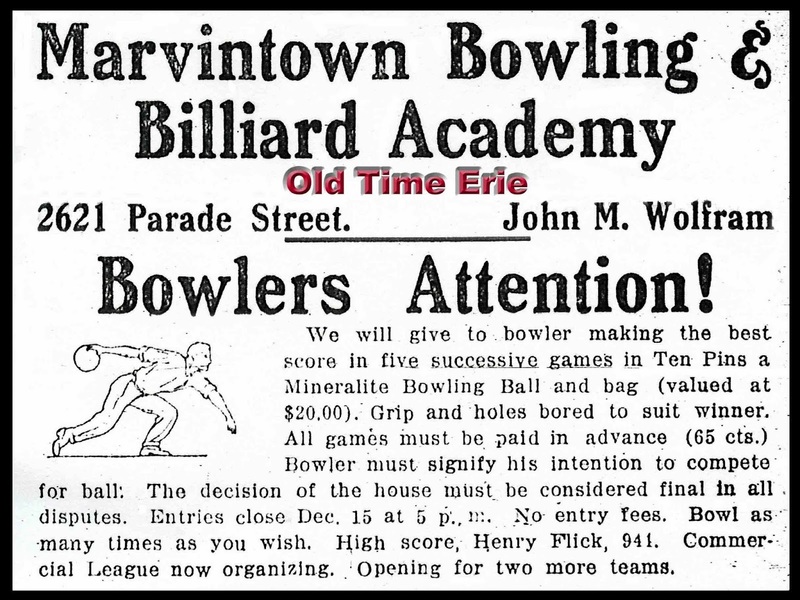 John M. Wolfram owned the bowling alley, which was located at 2621 Parade Street in Erie, PA. The text reads, "Bowlers Attention! We will give to bowler making the best score in five consecutive successive games in Ten Pins a Mineralite Bowling Ball and bag (valued at $20). Grip and holes bored to suit winner. All games must be paid in advance (65 cts.). Bowler must signify his intention to compete for ball. The decision of the house must be considered final in all disputes. Entires close Dec. 15 at 5 p.m. No entry fees. Bowl as many times as you wish. High Score, Henry Flick, 941. Commercial League now organizing. Opening for two more teams." -Erie Evening Herald, November 25, 1918. 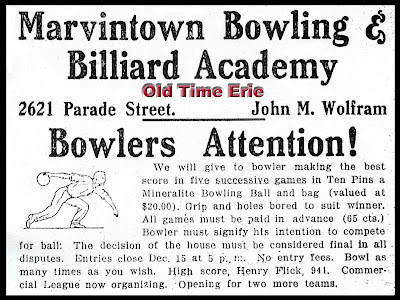 I wonder if the grandfathers of any of Erie's PBA bowlers such as Bob Learn Jr., Ron Palombi Jr. or Mike Machuga might have hung out at Marvintown Bowling. The Masonic Temple Building in Downtown Erie, PA was constructed in 1909 and completed in 1910. This six-story building is located on the northeast corner of 8th and Peach. The grand lobby has beautiful marble and woodwork throughout. 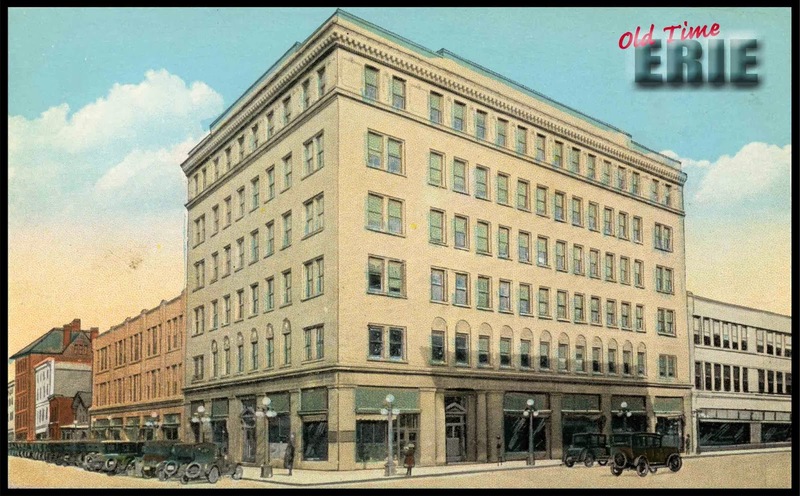 The scene in the postcard above is much different today because the old Boston Store was constructed to the north of the Masonic Temple in place of the three-story building shown here. (You could enter the Boston Store on Peach Street and exit on State St.) The three-story building to the right of the Temple was the Ensign Building at 16 West 8th Street. The Ensign was replaced by a five-story building that is now occupied by UPMC Health Plan. 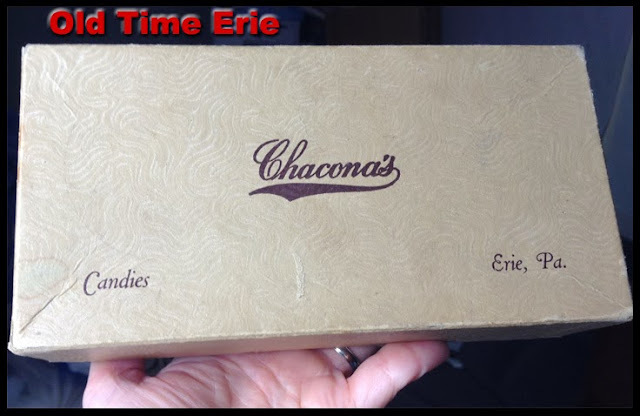 Chacona's candy and chocolate store was located between 7th and 8th (closer to 7th) on State Street in Erie, PA. Owner George P. Chacona opened his first store, the Erie Sugar Bowl, on October 15, 1893 at 810 State St., just eight years after coming to America with his brother Spero Chacona. In 1917 the store moved to 712 State St., where it remained until 1930, when the store moved to the ground floor of the Ariel Building. Mr. Chacona, who was born in Greece, also had stores in Ashtabula and Conneaut, OH. Chacona's became known for its hand-pulled taffy, homemade candies, chocolates, fudge and caramels. Eleven children of George and Anna Chacona were involved in the family business. After Chacona's closed, the building became the Carriage House Restaurant. One of my relatives gave me a box of negatives years ago, which I had put in a bigger box with photos and other negatives. I didn't think much about it until I was looking for a picture and rediscovered the Chacona's box. I wonder if this box was a Valentine's Day gift ages ago. 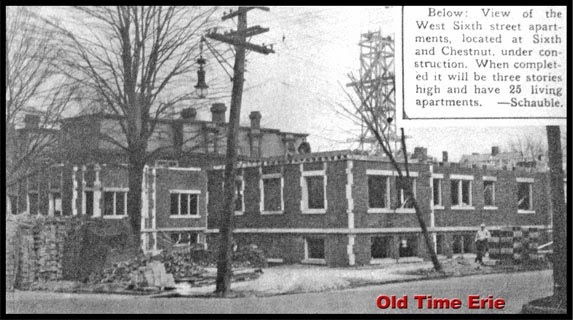 The U-shaped building on the southeast corner of 6th and Chestnut was under construction in the spring of 1924. This grainy photo was published in the Erie Dispatch-Herald. Gannon University students know this as the Kenilworth Apartments. This three-story building at 351 West 6th Street in Erie, PA sits on a 120' x 165' corner lot and houses up to 120 Gannon students. There are bricks, blocks and wood piled up on Sixth Street. Looks like a truck took out a tree while delivering construction materials on Chestnut Street. Selling points for potential residents: Each spacious apartment contains at least one kitchen, living room and bathroom, and some units have up to four bedrooms. Rooms are completely furnished by the university. There are two laundry rooms in the basement and key entry to the building to discourage unwanted guests. The downside? Limited off-street parking. Sounds like a sweet deal if you can afford the rent. Kenilworth is located across the street from the Watson-Curtze mansion/museum and within walking distance of the Gannon campus. See more fun facts and photos of Erie's history at: Old Time Erie. Historic Carriage Rides through Downtown Erie were held October 25th and 26th, 2013. Guides treated customers to stories of local legends and lore. The rides began and ended at Brewerie, 123 West 14th St. A behind the scenes tour of the spooky Union Station were held at the end of the carriage ride. As an added bonus, a ticket for the Historic Carriage Ride also admitted people to the Erie Haunted History Tour. Classic Downtown Erie. This looks like a scene that Tom Hanks would have used in the move "That Thing You Do." This is the west side of State Street. Woolworth's was located at 818 State, between 8th and 9th St. Kresge's was on the southwest corner of 9th and State, and Murphy's was to the south of Kresge. The five and dime stores attracted tons of shoppers, old and young. Woolworth's had a lunch counter where you could get a cup of coffee, a burger and fries, a milkshake or a cherry phosphate. The little kids thought it was fun to spin around on the floor mounted stools until their mother gave them "the look" and they stopped misbehaving immediately. Ahh, the good old days. Click here to share your memories of Woolworth's and Kresge's. How many classic cars did your family buy from Dailey's Chevrolet? 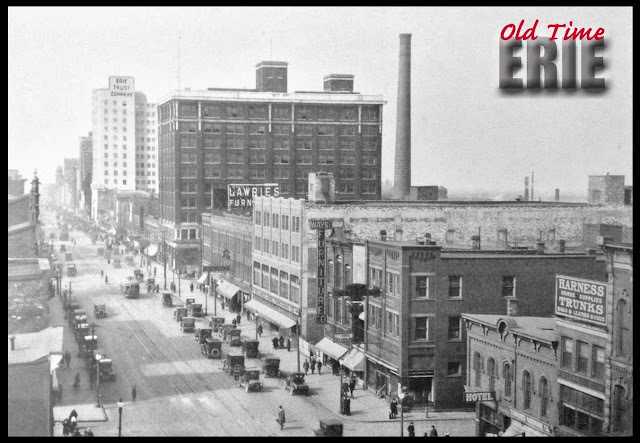 The lot was on the corner of 21st and State for years (pre-Hallman's), so I bet someone in your family tree shopped there. 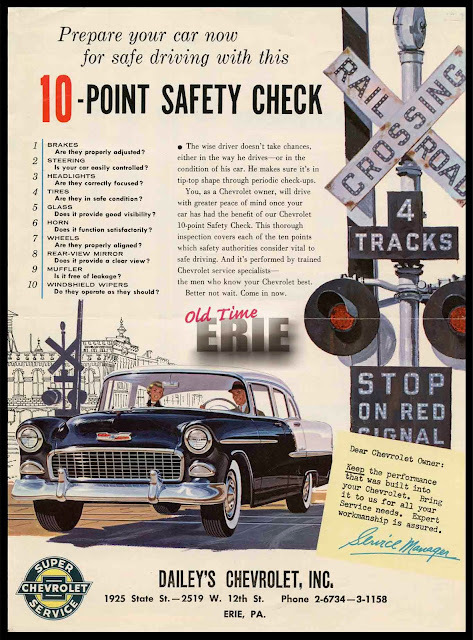 The ad shown above was mailed to customers to promote new cars, including the '55 Chevy crossing the tracks on the cover. A series of these four-page flyers were sent out to potential buyers to promote new vehicles and also to remind people to service their cars. Need new brakes? We've got 'em. An alignment? Check. Tire rotation? Yep, we do that too. "The wise driver doesn't take chances, either in the way he drives- or in the condition of his car. He makes sure it's in tip-top shape through periodic check-ups. You, as a Chevrolet owner, will drive with greater peace of mind once your car has had the benefit of our Chevrolet 10-point Safety Check...Better not wait. Come in now." The inside of each flyer had practical information for the home owner. This one included examples of common nails, finishing nails, household tacks, cut nails, roofing nails, spikes and casing nails. I could have used this chart when I redid my garage roof. In the hot sun. Not fun. I just found this awesome shot which documents the important role that Erie played in Great Lakes shipping in 1960. There were at least 15 piers, wharves or docks in Erie at that time. We'll focus on one of them today. 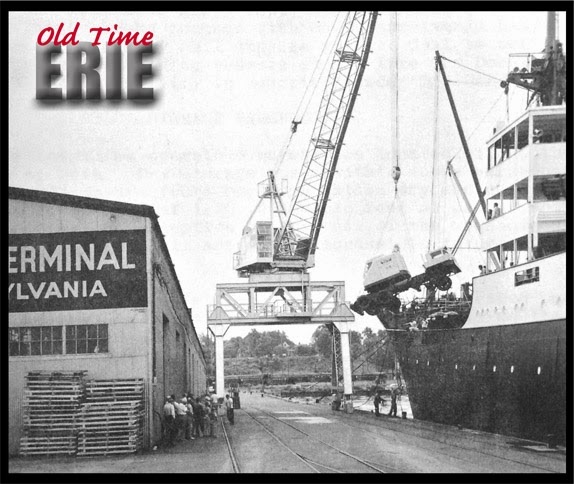 "The Duquesne Marine Terminal Pier is owned by the Port Commission, City of Erie, and operated by the Western Stevedoring Company for handling general cargo in foreign and domestic trade. This pier is located between German and Holland Streets extended and provides 1,130 feet of berthing along the west side and 1,335 feet along the east side; water depths along the sides range from 22 to 27 feet at low water datum. A one-story 783 by 72 foot steel frame, metal-covered building is located along the rear of the west side of the pier and provides a total of 56,376 square feet of space; part of this building is used as a transit shed, and part as a public storage warehouse. In addition to covered storage, about 5 acres of open storage are available on the pier." -U.S. Army Corps of Engineers report. Look closely on the right side of this picture and you'll see a large truck being lifted by the crane. This shot looks south toward the city of Erie. Here is a modern shot of DonJon Shipbuilding and the Intermodal Transportation Hub which appears on the Port Erie website. I found this cool shot of State Street taken in 1926, so I took a break from my studies to write a new post. This photo shows the east side of State from 10th to 13th Street. The tall cream colored building on the left is the Erie Trust Company (later the Baldwin Building or Renaissance Center) at 10th and State. It still stands. The tall building to the right is the Commerce Building at 12th and State, which has since been demolished. The sign for Lawrie Brothers Furniture, at 1207 State St., is partially visible. Reliable Furniture was located next door, at 1213-1221 State St. The Wayne Furniture Company, at 1223-1225 State, rounds off Erie's original Furniture Row. 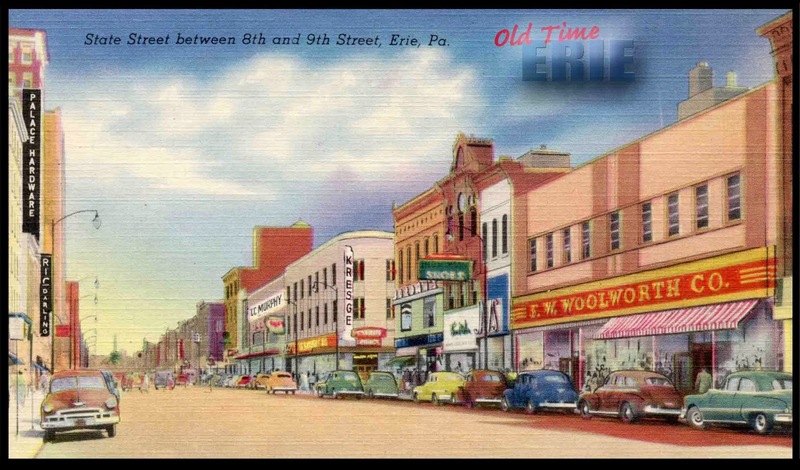 Erie Sea Food House was located at 1227 State, and Erie Window Glass Co. was on the corner of 13th and State (1229 State St.). The New Commercial Hotel was across the street at 1301 State, Schneider Hardware was next door at 1303 State, and Joseph Erhart sold harnesses, horse supplies, trunks, bags and leather goods at 1305 State St. Most of the buildings south of 12th Street still stand. In case you're curious, I'm studying the human genome. Be thankful I'm writing about State Street rather than bombarding you with details of DNA, nucleotides, cytosine and histones.